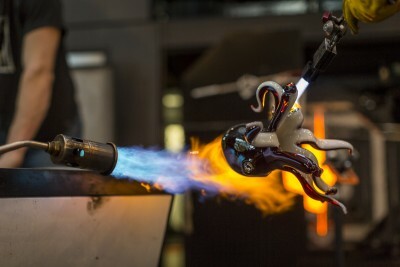 At 2300°: Countdown in February, Raven Skyriver sculpted one of his favorite animals out of hot glass in front of a packed crowd. I caught up with him after the show to find out more about his work. Tell me about where you got started with glass. I started blowing glass in high school in 1999 on Lopez Island, which is in the San Juans. It’s the Northwest corner of the United States; about an hour and a half north of Seattle, WA. A lot of my work is inspired by the marine environment and what I grew up around. Tell me more about where you grew up and how that is an influence. I was born in a small house with no running water or electricity, no TV, kind of in the woods and on the water. The environment that I lived in was always a big influence on my life, so that translates into my work and informs what I make. It’s part of what I believe is important in life and the world. It was a vocational program where some kids went and worked for carpenters and some kids did other things. I ended up working with a good friend and mentor on the island, a glassblower by the name of Lark Dalton. He took me under his wing and I blew glass for the last two years of high school. Then he showed me how to build some rudimentary equipment and I had my own little shop; it was the most basic set up you could possibly have. 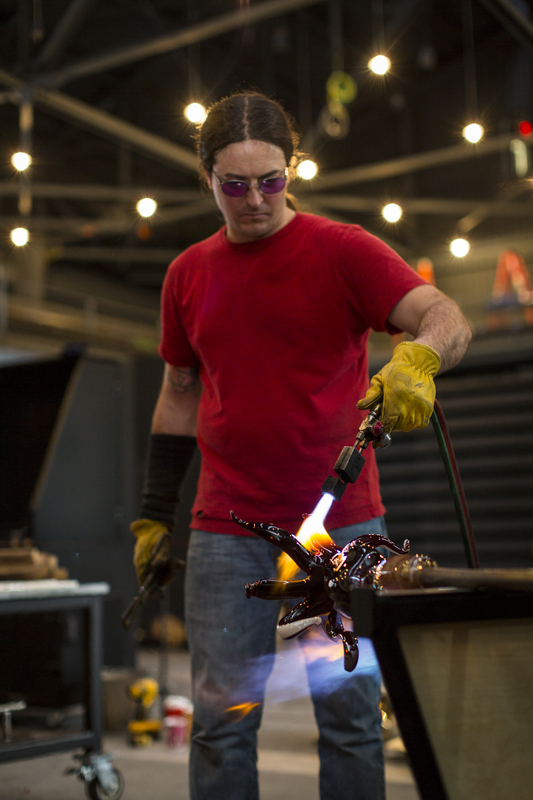 The Pacific Northwest is a huge center for glass; it was a really fortunate place to get into glass. I was really passionate about it and I stuck with it. Tell me about what you worked on tonight. Tonight we made a humpbacked whale. You can see a humpbacked whale anywhere in the world; they’re all over every ocean and they’re just beautiful creatures. Actually, the Save the Whales campaign used a humpback as their mascot because they’re beautiful creatures and have an amazing song; they communicate by singing and make a migration of over 5,000 miles from the Arctic feeding grounds to where they calve in more tropical climates. They’re pretty phenomenal creatures. Does the humpback whale have significance with the area where you grew up? It does for sure! The native people that come from where I’m from hunted whales, it was a big source of sustenance. Whales are also creatures that were revered in a lot of ways. Most of the animals that I depict fall into that category. When I started out in high school, I started with a traditional Venetian technique. I was rolling up cane and blowing functional vessels, which I still love but I don’t do so much of. That was a great way to get my chops and start working. When I started working sculpturally, I was invited to work on Bill Morris’ team by Karen Willenbrink. When I started working with her, I discovered the freedom of sculpture and what it allows you to say. Sculpture gave me a voice and an ability to say something with what I was making more than the technical aspect of making Venetian glass or vessel work. A piece in progress by artist Raven Skyriver. You do a lot of different aquatic forms like fish and whales. Do you have a favorite form that you like to use? My favorite form is probably the newest thing that I’m working on. I have a lot of ideas and a lot of things that I’d like to make and create and, at this point, the freshest thing is tortoises and sea turtles. We’re going to put one of those together in the new hot shop here at Corning, so that will be really fun to try out. It’s a little nerve racking, too, but it’s always fun to try something completely fresh. 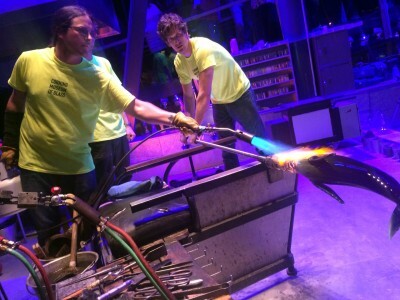 Artist Raven Skyriver working on a piece while testing the new Amphitheater Hot Shop. Describe what it’s like being here and this event. I taught here last week; it was a great class and then this week, I’m testing out the new hot shop. Eric [Meek] invited me here to be a part of test running the hot shop. It’s like a glassblower’s wonderland, a glory hole behind every corner and a furnace here and there and everywhere—it’s just ridiculous. Being here is an honor and a pleasure; it’s always a place I’m excited to come back to.